Kontroltek is based in Bridgend, South Wales, and specialise in Industrial Electronic Repair and Supply. Their target market is the manufacturing sector, ranging from small precision engineering companies to large corporations. Kontroltek was founded in 2011, with a philosophy of providing cost-effective, top quality electronic repair solutions for businesses through all industry sectors. This philosophy remains engrained at the heart of the company, who, since start-up, have expanded UK wide and are now establishing themselves in Europe. They currently have two UK branches: their headquarters in Bridgend, South Wales, alongside a branch in the West Midlands. Due to the rapid growth of the business, it has been vital in 2017 for them to review the business’ entire marketing mix, and an overhaul of staff uniform was definitely needed. In the past, Kontroltek have used a large and sporadic multitude of uniform suppliers, alongside a separate company for printing and embroidery needs. They needed a cost-effective solution to this so that all members of staff were supplied with excellent quality uniform, with one collaborative supplier. They wanted to achieve up-to-date, professional uniforms for all staff members that also showcased a clean and proficient brand image. Their main constraint was budget, along with finding a style that made every member of staff feel comfortable and confident. 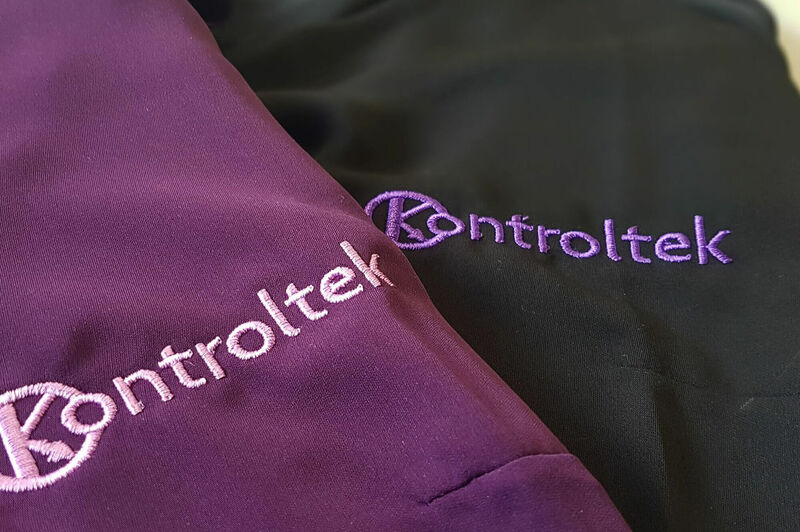 Working alongside Steve, Kontroltek came to a decision of a combination of purple and black Brook Taverner blouses for the women in the office, which were embroidered with the Kontroltek logo. They also had lilac and black shirts with an embroidered logo for the men. Kontroltek were extremely satisfied, and we were even able to create individual uniform packages for them, which made distribution to staff easy. The staff were completely impressed: before now they had received just basic black shirts, and this new uniform and style allowed office staff to retain an inherent sense of individuality whilst conforming to a professional and consistent brand image. They have also received several compliments from customers, and saved a significant amount of money, too. For them, Corprotex proved that excellent quality doesn’t have to cost the earth!